Ehrenfest with his students. The photograph was taken during Fermi's visit to Leiden in the Fall of 1924. From left to right: Gerard Dieke, Sem Goudsmit, Jan Tinbergen, Paul Ehrenfest, Ralph Kronig, and Enrico Fermi. Ehrenfest's extraordinary ability "to grasp the essence of a theoretical notion, to strip a theory of its mathematical accouterments until the simple basic idea emerged with clarity" made him "a peerless teacher," as Einstein once wrote. But something else is needed if one's students are to go on to do independent research. They must acquire confidence in themselves as physicists and have the courage to pursue their own ideas, to find and follow their own ways. Ehrenfest knew only too well from his own experience how crucial this aspect of the teacher's role could be, and he took it very seriously. Sometimes even brief contact with Ehrenfest could provide the all-important support that gives a young man confidence to go on. When Enrico Fermi came to Leiden in September 1924 he was only twenty-three, but he had already published a score of papers on a variety of problems in theoretical physics. Fermi had recently spent half a year at Göttingen, working at Max Born's institute. Despite the presence there of his brilliant contemporaries, Wolfgang Pauli and Werner Heisenberg — or perhaps because of their presence — Fermi's time at Göttingen was not a great success. He did not really become part of Born's group, and left Göttingen "groping in uncertainty and seeking reassurance". He knew that he more than measured up to any of the other Italian physicists, but he had doubts about where he stood when judged against Europe's best. In Rome Fermi had met one of Ehrenfest's students, George Uhlenbeck. On Uhlenbeck's urging, Fermi visited Ehrenfest in the Fall of 1924. The months he spent in the warm and friendly atmosphere in Leiden made a major difference to Fermi. Ehrenfest's encouragement was accompanied by his authoritative judgment that Fermi need worry no longer. Ehrenfest provided the "wished-for pat on the back" that Fermi had not received from Born, and Fermi never forgot it. The supremely self-confident Fermi that the world of physics soon came to know has to be included among the many who felt Ehrenfest's influence in their lives. Martin J. Klein, Physics in the Making in Leiden: Paul Ehrenfest as Teacher, in "Physics in the Making: Essays on Developments in 20th Century Physics" (Elsevier, 1989). The first contact in Rome between Uhlenbeck and Fermi had itself been initiated by Ehrenfest. During his Göttingen stay, Fermi had published a paper on the ergodic theorem that had caught Ehrenfest's attention. When Uhlenbeck was in Leiden in the Summer of 1923, Ehrenfest asked him to carry a letter to Rome with questions for Fermi. Here you can read how George Uhlenbeck recalls the encounter fourty years later. Fermi's visit to Leiden was supported by a six-month Fellowship from the Rockefeller Foundation. Here is the letter reporting on that award (with comments from Ehrenfest). Somehow, Fermi managed to publish a paper (actually, more like a research report) in Dutch during his stay in Leiden: Berekeningen over de intensiteiten van spectraallijnen, Physica 4, 340-343 (1924). A second foreign visitor arrived in Leiden while Fermi was there, Ralph Kronig from Columbia University. He recalls this visit here. 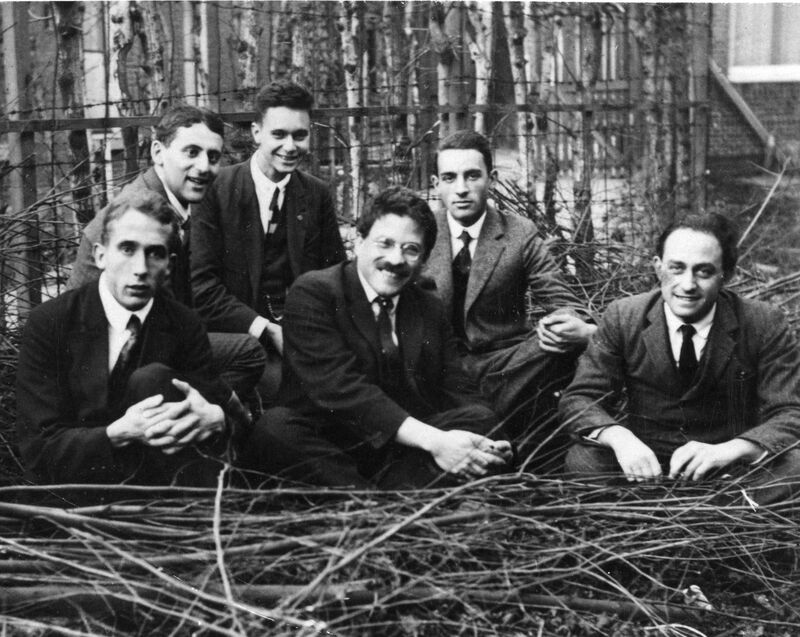 The photograph above shows Fermi and Kronig with Ehrenfest and three of his students: Goudsmit would share with Uhlenbeck and Kronig in the discovery of the electron spin, as he recalls here. Tinbergen did his Ph.D. with Ehrenfest on a topic at the interface of physics and economy, and would eventually become the first Nobel laureate in economy. Dieke became one of the world's foremost experts in spectroscopy.